If you read my blog last month on Capri, you know that I finished it off with a little teaser about Positano, one of my absolute fav places on Earth! To recap, we had such an incredible day on the island of Capri but it didn’t end there. Instead of a round-trip back to Sorrento (where we were staying), we chose to venture over to beautiful Positano. After a short ferry ride and a little snooze, we arrived. 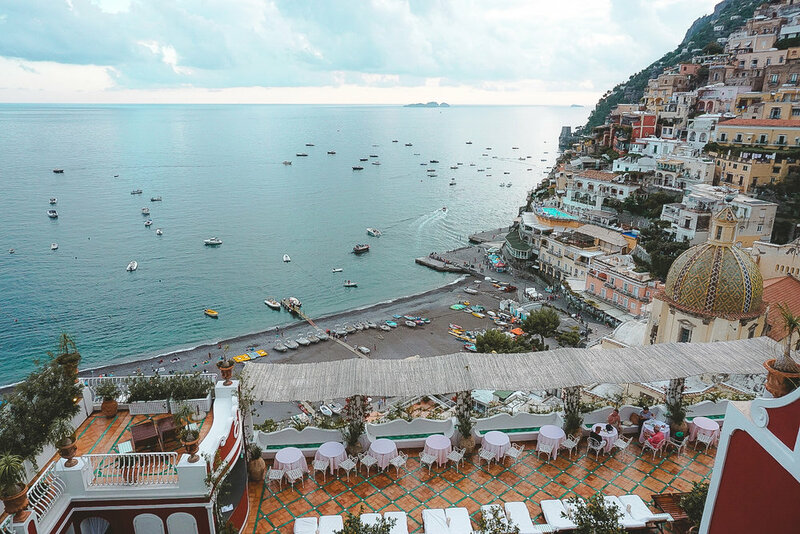 Positano is everything you could wish for, and so much more. This dream town, painted with pastels, is embedded into the mountainside with breathtaking views of the Tyrrhenian Sea. Cute restaurants galore with cozy terraces and shops filled with Limoncello and handmade dishes line the narrow streets. Cars do not fit on these quaint streets, making it the perfect place for carefree exploration (aka not worry that you're about to get run over by crazy Italian drivers lol). We didn’t waste any time. As usual, I was on a mission for the most chic vibes I could find. 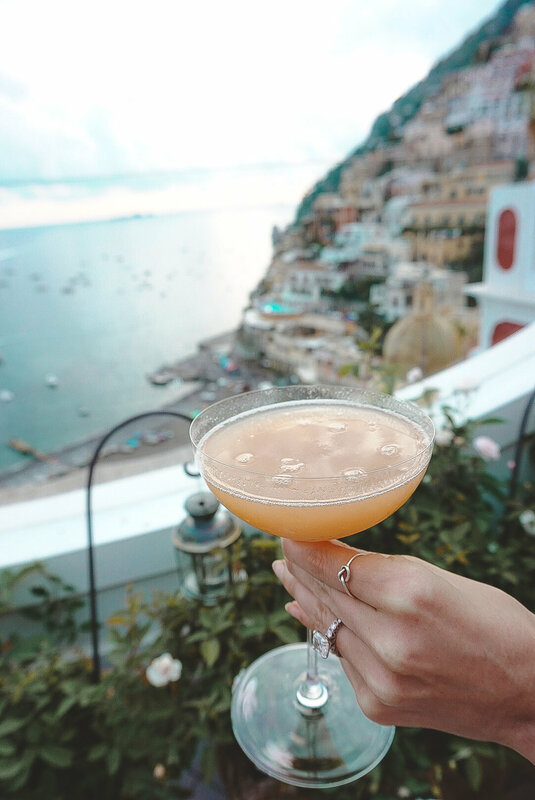 I have followed the beautiful blogger, Ohh Couture (my forever girl crush), for some time now, and after seeing her stunning Instagram posts about the magnificent hotel Le Sirenuse, I knew that I had to add it to my bucket list. Upon arrival at Le Sirenuse, we were greeted by a polished doorman who suggested we head over to their cocktail lounge, Franco’s. My jaw literally dropped to the floor when I walked in. The view of Positano as the sunset, the deep house music playing at just the right level (the type of music an establishment plays is everything to me), and the avant-garde aesthetics of the terrace were a killer combination. I mean…THAT VIEW!!!! Can you say, Insta worthy?? My beverage of choice was a bellini, and it was the perfect balance of sweet and tart. 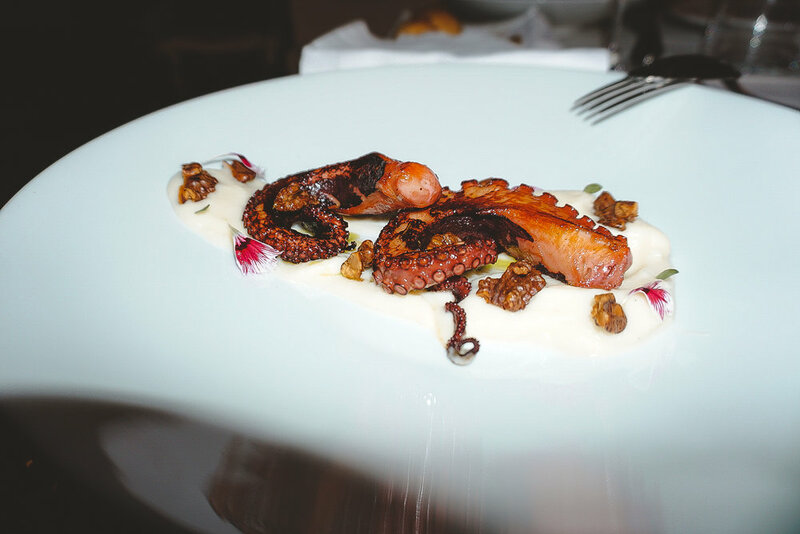 Overall, Franco’s exceeded my expectations. If you are heading to Positano, this place is a MUST for drinks and vibes! My sweet husband booked us a lovely dinner at Terrazza Cele, aptly named for its amazing terrace over looking the Tyrrhenian Sea. Since our trip wasn’t during peak season, the restaurant wasn’t overly crowded which made it nice and intimate. Overall the restaurant was decent, but the wine and views made it worthwhile for a romantic evening! Of everything we tried, the lobster with linguini would be our recommendation (but be prepared for small portions and a fairly steep bill). On the wine front, wherever we went in Europe we tried to drink the wine from that country and, if possible, from the local region. We stumbled upon some great vinos this way, our fav probably being Verrazano from the Chianti region in Tuscany, where we had an amazing farm-to-table dinner at the actual vineyard, which happens to be Verazzano’s castle! By the time we were finished our dinner, our car was ready to pick us up to head back to Sorrento. Since the ferries stop running at a certain hour, a car service was really the only option for our return trip. The transportation in this region is a bit of a sh*t show as I will get into it briefly. We loved Positano so much that we decided to head there again the next day. We originally planned on bussing there but the bus system was so chaotic and unorganized (Eric almost dropped the gloves with the bus ticket guy, I am half kidding). It was definitely a bit stressful that nothing in Italy was ever organized. After a bit of a debacle, we decided to just jump in a taxi. Do not make the mistake that we did. Taxis are outrageously priced!! It was over 100 USD to drive 30 minutes (less than 10 miles). The ferry is the way to go if you are able to plan and book in advance! The ferries don’t run late at night so make sure you plan accordingly. Since we had already walked the streets the previous day, we felt like relaxing on the beach and drinking some wine. With Positano being the second to last stop on our 5 week, action-packed vacation, this was the first time we actually just chilled out. Before hitting the beach, we of course had to stop and get one last cannoli in Italy. You have to treat yourself every once in a while right?? We strolled down to the beach where we found some lounge chairs to rent for a pretty low cost. Since it wasn’t the peak season, this was fairly easy. I would imagine mid-summer this could be a daunting task. The best part about this beach was the wait service which delivered us a delicious, crisp white wine to quench our thirst! This was the perfect day to finish our time in Positano. When we were originally faced with the decision of whether to stay in Sorrento vs. Positano, the recommendations from our friends were split. While Sorrento is more of a hub, as Positano is a bit more remote, in our opinion it is a no-brainer to stay in Positano. The overall vibe was a bit more chic and trendy which really suited our style much more. If we could do it all over again, we would definitely choose to stay in Positano over Sorrento. If you are planning to visit, make sure to book your room well in advance, as accommodations are definitely limited in this area. I would love to hear your feedback in the comment section below! Don’t forget to subscribe at the bottom of the page if you would like to keep current with me!